And here we are. Remarkable. Wonderful! This day. This moment. It’s truly extraordinary: bringing together tradition — those things we do each and every commencement and cherish — and the unique — the distinctive and individual promise and purpose of each of our graduates. Let’s look around and see who’s here. First, the Faculty of the Pardee RAND Graduate School. A most distinguished, and essential, group of scholars, mentors, and role models. They’re joined today by Sharon Arnold, who received our Alumni Leadership Award last night. Our honorary degree recipients Anne Case, Alex McDowell, and RAND’s own Natalie Crawford. John Seely Brown, our Commencement speaker. JSB is joined by his fellow members on both the school’s Board of Governors and RAND’s Board of Trustees. RAND’s president Michael Rich is here, of course, along with a number of members of RAND’s leadership team. And, it is a great pleasure to welcome the families and friends who have gathered here this morning to celebrate the accomplishment of our graduates and to look forward to what lies ahead. It’s safe to say that this day could not have come without your support. I must also pause and acknowledge who is not here today. 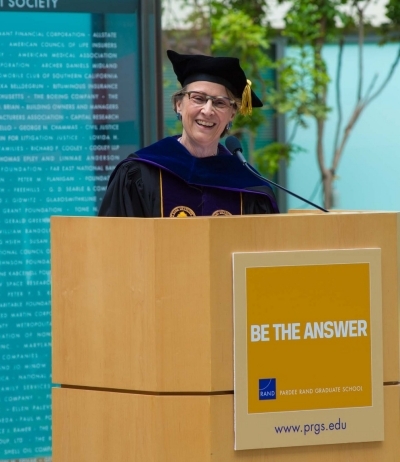 This is I believe, the first commencement in the nearly fifty-year history of the RAND Graduate School taking place without our friend, founding Dean Charles Wolf. Charles was far more than the founding dean -- he was a man of vision. In the late 1960s, Charlie, former president Harry Rowen, and others at RAND imagined a graduate school that had yet to be conceived. One that would award a new Ph.D. in policy analysis. A school that embodies and extends the best of RAND. Graduates. You are why we are here. To honor what you’ve done and to celebrate what you bring to the world. Truth be told, the deans and I, and your faculty, we’ve been thinking about the gifts you would bring— the skills, the talent, the perspectives—since we first read your applications and met you with admitted students at Preview Weekend. As we’ve looked forward to Commencement, I’ve realized that what the world may require from you most of all is to take these skills and talents and use them to build and create the institutions and new communities we need for the 21st century. As Ann Pendleton-Jullian reminds us, we are living in a white water world of rapid and often unpredictable change. The demands for new thinking and a deep understanding of what it takes to effect positive change are real. An emerging characteristic of this turbulence, in and outside of the United States, is a tendency to lash out and tear down. To declare the system broken, to break out into tribes, and to raze the institutions that have long defined much of the world. Graduates…Eric, Andrew, Chris. Tim and Bonnie… You and your classmates, the skills that you take away from this school are the counter to this instinctive tearing down. Melody Harvey shows us the life-changing effect of financial education for first-time college-goers and supportive housing for those homeless. Sung-bou Kim brings us to a better understanding of combating wage inequality and building human capital for women and youth. The work each of you have done, and the work you will do, is about building up, establishing connections, and identifying opportunities for action. This is what we need. Now, it’s not to say that that the institutions we typically think of as the cornerstones of our communities are by any means perfect. Government, academic, religious…electoral systems and the press. These are the institutions that have long provided structure and political order across society. They define who we are as nations and people. Could they be better? Of course. Representative government has not always represented all the people. Economic disparities have increased. Social isolation cuts across every demographic, working class and celebrities alike. The roots of our modern school systems, whether K-12 or universities, lay in 19th century management ideas and medieval traditions. Precisely because these institutions define our societies, they must be examined if they are to be strengthened. This kind of examination, this questioning, objective but with deep care for the public interest, is who we are at the graduate school and at RAND. It defines the work of our students and graduates. Ervant Maksabedian has asked these questions about medical insurance and the treatment of opioid addiction, and has proposed reforms to build a better system. Annie Boustead digs deep into the question of whether smart phones and privacy can coexist and has proposed policies for police surveillance consistent with the values of our communities. Graduates, your questioning and pushing of these foundational institutions to do better is indispensable. But we ask more of you. As the world has changed, as it moves faster, and as frustration and anger builds with uncertainty and a sense of being left behind, we need you to harness these white waters for the good. To look more widely for new solutions for those problems we’ve yet to solve and to consider and help design the new institutions of this 21st century. RAND’s David Ronfeldt has written extensively about changes in the way society organizes itself. At first, kinship-based clans and tribes were the primary organizing principle. They were followed by the establishment of hierarchical institutions that included armies, the church, and the state. Next came the rise of competitive markets with trading and banking, establishing new, global, connections and influence. A decade ago, Ronfeld identified a fourth organizational form, multi-organization-networks. The internet, powerful computing, and social media have resulted in explosive growth in our now networked globe. The unanticipated, negative effects have been dizzying. We see this in the Dark Web and in the rapid spread of real and false information. And, in a loss of trust in these very same foundational institutions—the exacerbation of Truth Decay that RAND’s own Jennifer Kavanagh and Michael Rich called attention to with their research. But we also see the great promise of this networked world, with the possibility of new human connections that cut across traditional divides, and policy solutions from previously untapped resources. We have real world examples of these new connections: Online communities like those found in World of Warcraft or those that reconnect the homebound elderly may offer refuge, strength, and unconditional support, reducing social isolation. Netflix has largely put aside traditional demographics to sort its subscribers. Instead of categorizing them by age, gender, race, or even country lived in, the Internet-based service has organized 125 million subscribers from across the globe into more than 2,000 microclusters of “taste communities.” These new communities are making connections that even those in them don’t yet understand, defying our preconceptions when they bring together shared values and interests between a 75-year-old man in Denmark and a California teenager, both fans of the series Riverdale and thus potential fans of similar shows. RAND researchers and students are deep into pursuing the use of online communities to provide new policy solutions. Just this past week, several of our first-year students offered the idea of leveraging scalable services, similar to platforms like Uber or Airbnb. This platform would match mentors with time and expertise and mentees who may be at high risk of homelessness, and provide coaching in financial management, job searches or one of the most challenging roles of all, parenting. Many of you know something about that. Social media has fanned the flames of hyper-partisanship, but it has also combined with the broader internet to power civil society and the private sector to partner and achieve new solutions to seemingly intransigent problems. By harnessing the communication power of the internet, a national coalition of allies has been built connecting the farmworkers in Florida, fast-food retailers and industrial farms. Together, they have built wholly new institutions that are transforming agricultural labor across the southern U.S. and up the east coast. Chefs, led by Jose Andrés and Robert Egger, have partnered with suppliers and international and domestic nongovernmental organizations, to provide immediate and massive disaster relief through their World Central Kitchen. These chefs and their crews are providing relief in Puerto Rico, Guatemala, and Hawaii. They’ve moved faster and more effectively than traditional government relief organizations. World Central Kitchen and the farmworkers’ Fair Food Program are essentially new types of institutions and solutions, made possible because of technology. Technology is changing everything. Combined with human understanding and persistence it is getting the job done. Certainly, there are days where scorched earth seems to be the dominant policy perspective, and the glee many seem to find in tearing down also blinds us to recognizing shared humanity. And yet, the turbulence in the modern world offers possibilities for you, our graduates to seize. Olena, Daniel, and Aziza. Lopa and Min. Each of our new graduates, your work is to question but also to do. It is in the doing that you are able to build up rather than tear down and leverage the rich resources of technology and of communities to find new solutions, strengthening and creating institutions that are the foundation for building our families and society, whether in our neighborhoods or across the globe. By calling on your new skills and your long-held talents, through word and action, and with love and patience, you will surely help build a better world. I would now like to introduce the President and Chief Executive Officer of RAND, and the Pardee RAND Graduate School’s long-time supporter, Michael Rich.